I've always been quite a fan of California Pizza Kitchen so when they politely asked if I would like to try out their new menu, I simply couldn't say no. So there I was, on a hectic weekday evening, decked out in my Sunday best, hungrily awaiting the onslaught of food. 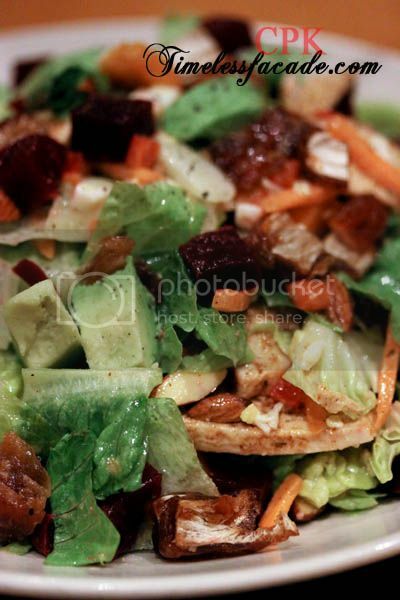 One of the latest entries into CPK's salad lineup is the Moroccan Chicken Salad, which comes with a bagful of ingredients such as Moroccan spiced chicken breast, butternut squash, avacado, beets, cranberries, just to name a few. It does sound like a healthy albeit weird combination but I personally found it interesting with the myriad of texture and tastes. But it did get to a point where I didn't exactly know what I was eating due to the mish mash of flavours. If only they had it in smaller portions (half size is still too big in my humble opinion). Apparently Sonora is a state in northwestern Mexico, which explains the Tex Mex vibe I got from eating the egg rolls. Crisp wanton skin wrapped around grilled lime chicken, roasted corn, black bean salsa, cheeses, roasted mild chillis and the likes - Nice blend of creaminess and a mild corn taste. The ranch dressing was a little like tartar sauce with a bit of spice from the bottled Cholula hot sauce. 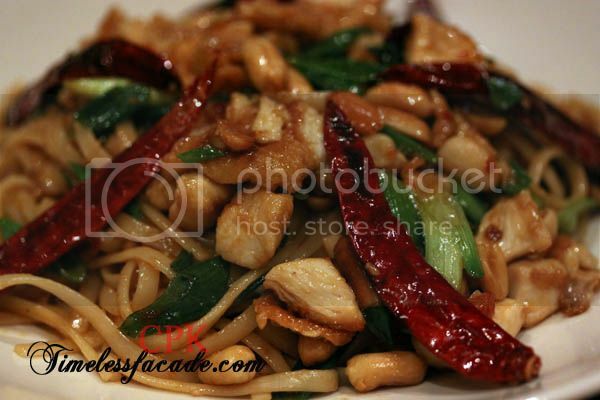 CPK's interpretation/add on to the traditional Chinese Kung Pao chicken, throwing pasta into the equation. The result? An interesting combination of east and west. 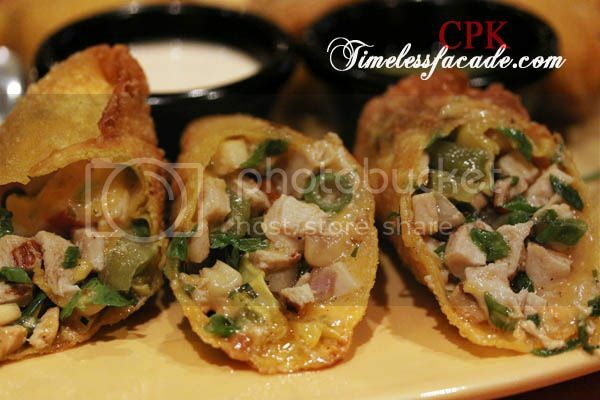 The chicken slices were coated with egg and lightly fried. Throw in nuts, the quintessential dried chillis (more for presentation than spice honestly) and Kung Pao sauce and you have something simple yet delightful. It would have been better if the linguine was cooked a little firmer. 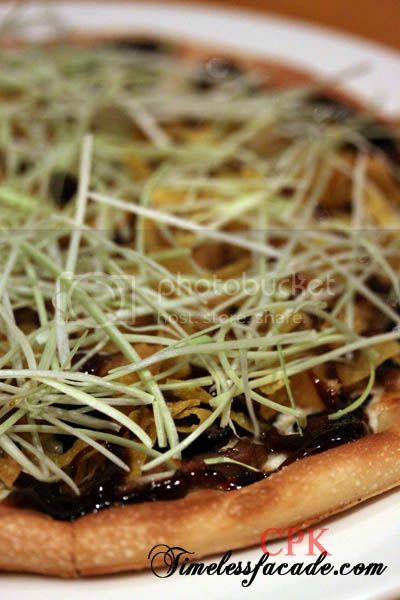 One of the signature pizzas of CPK and probably the most unusual I've tried so far, the Peking duck pizza had an overdose of hoisin sauce this time round as compared to what I had on my previous trip. Nonetheless, it managed to maintain the chewy and flaky texture of its crust coupled with crispy wonton skins, duck slices and shiitake mushrooms (both of which I failed to notice, probably due to the thick sauce). So who's up for a western take on the peking duck? This pizza came in the form of a thin crust. 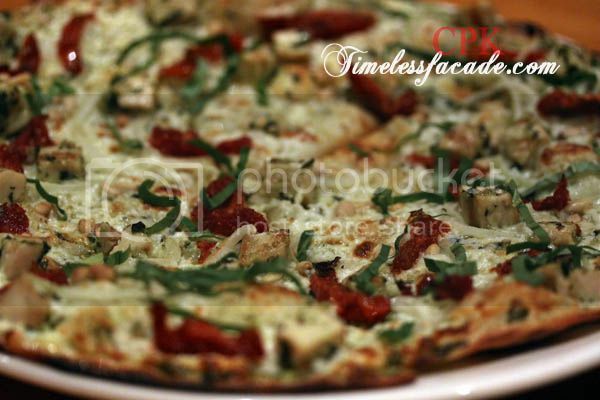 Unlike the thin crust pizzas served in Italian outfits, CPK's version is considered an inbetween. Thinner than your regular thick crust pizzas yet thicker than your usual Italian thin crusts. Taste wise, the pesto base was reassuring with the sundried tomatoes but honestly quite a boring pizza - no twist or turns to entice me to take another slice. But maybe that's because I'm not a huge pesto fan. The first thing that hit me when I took a bite of this pizza was that my digestive tract had too much sodium going into it and I was reaching out for my glass of water in an attempt to dilute/neutralise it. While it may sound like a joke (yes it is! 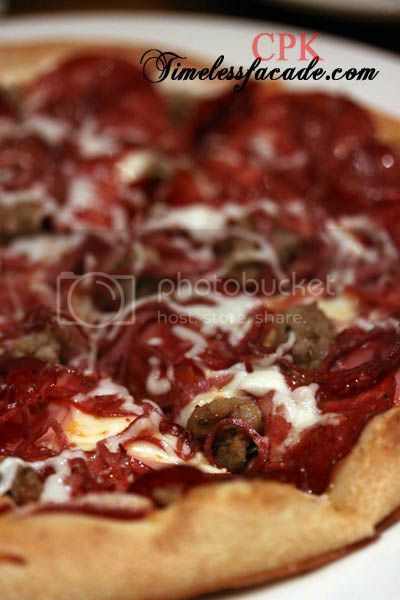 ), the pizza as a whole was really quite salty probably due to the combination of salami, pepperoni, Italian sausage and bacon. I am a carnivore, but in this case, less is more. Thankfully the crust was nice and the cheese gooey. And of course for that glass of water beside me. To be fair, the tiramisu was decent, but not the authentic Italian kind I was more exposed to. For starters, the alcohol wasn't quite prominent and the mascarpone reminded me more of ice cream. 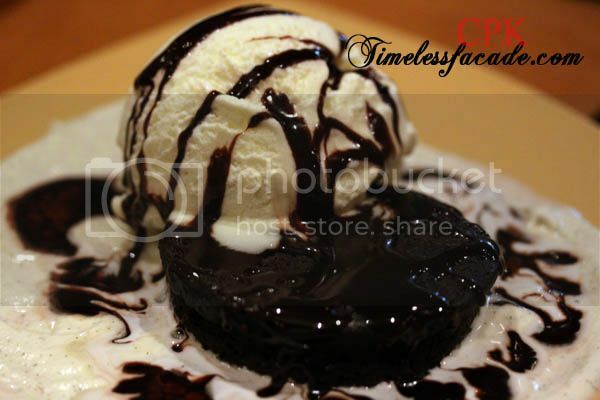 Instead of the usual cocoa powder, shaved chocolate was used. 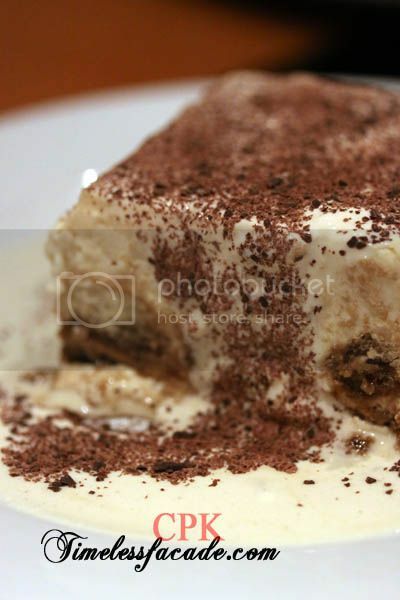 Very palatable and best eaten without any preconceived notions of how a tiramisu should taste like. No oozing chocolate (which was a disappointment really), but still enjoyable nonetheless with its dense chocolate concentration as well as the nice thick chocolate sauce drizzled over it. Let's not forget the huge scoop of vanilla bean ice cream. Sinful comfort food. 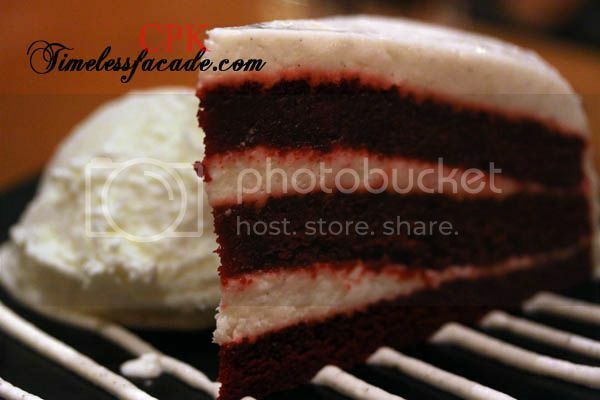 What's interesting about this cake is that the the addition of beet into the mixture gives rise to the layers of red sponge, which is frosted with white chocolate and vanilla bean cream cheese. In reality however, it didn't taste too much out of the ordinary, very much like white chocolate cake with a nice creamy finish. Many thanks to CPK for the invite and their kind hospitality. 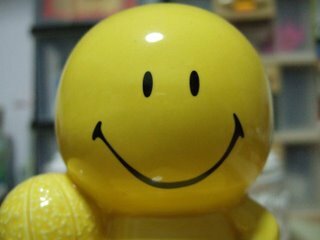 See my previous entries on CPK here, here and here.